BallinEurope’s man in Italy, Enrico Cellini, contributes quite a bizarre story out of league basketball there. (To think that Cibona Zagreb fans merely created an interesting image in protest of their team’s poor play.) The headline gives away the punchline so BiE won’t forestall this tale’s telling further … um, enjoy. On January 2, Scavolini Siviglia Pesaro (then 6-6 in Italy) was supposed to be fully focused on preparing for the toughest match of the season, i.e. the Serie A game against almighty juggernaut and five-time repeat champions Montepaschi Siena. Nobody could have ever expected that the greatest challenge for the team would come from outside the court. On the morning of the game, Pesaro officials informed media that head of a pig had been left in front of Scavolini Pesaro basketball operations offices by an indignant anonymous fan or group of fans (or rather, more appropriately, “fanatic” or “fanatics”). 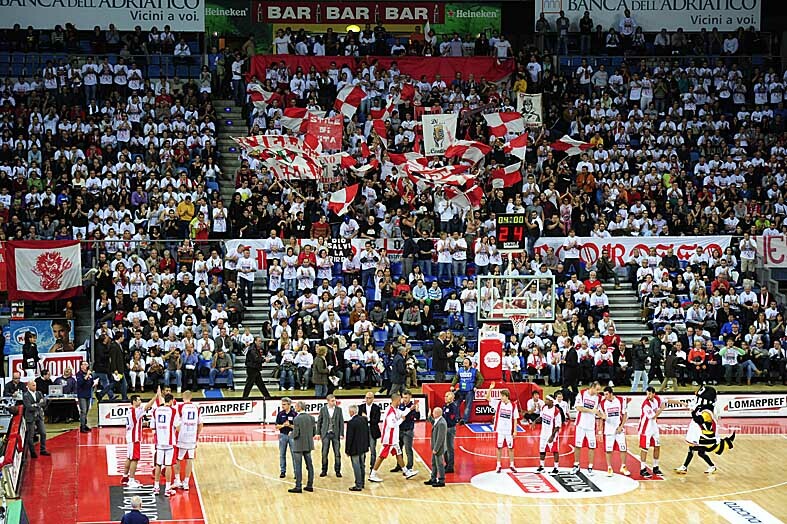 Pesaro is one of the historical venues of Italian basketball, with a long history of passion and prestige. Nowadays, the club can count on a young and dynamic team including former USC/current Team Italy point guard Daniel Hackett, former Philadelphia 76er Jumaine Jones, and high-flying forward James White, but big-time ambitions are not realistic. After the act of intimidation, players and coach stuck together and responded in they only way that could possibly fix the situation. Remember the game at Siena? Despite running with a seven-man rotation, Pesaro played solidly, had all five starters scoring in double figures and took the upset win by three points on one of the most hostile courts in all of Europe. Five days later, Pesaro hosted top team Virtus Bologna (you know, the guys who tried to hire Kobe Bryant). Led by Richard Hickman, Pesaro provided a great display for its home fans in shooting 55% from inside, 52% on threes, and bringing home a second consecutive win. The fan(s) inform that the accompanying letter was signed by the name of former Pesaro coach Stefano Pillastrini and was not entirely publicized after the incident. In an undisclosed part, right after “the next one will be for Dalmonte,” the fan(s) claim they made the fake Pillastrini say, “I have eaten the rest of the pig” in a jab at the coach’s chubby build. In the email, there is no sign of apology: Notwithstanding feeling “extremely surprised” and “terribly sorry for the spin that this thing has taken” in the media, the prank was explained to be a “goliardic joke” that became greatly exaggerated. While striving to minimize the scale of the issue in the media, the Scavolini Siviglia Pesaro organization has taken the threat very seriously and has informed the authorities. No surprise. Those things happen over here. Not as often as in soccer but they still happen, especially in those cities where basketball is fairly big. They almost always are goliardic jokes. Either way, joke or not, fans went too far. You’ve got to draw a line at some point. Unione Sportiva Victoria Libertas Pallacanestro, a.k.a. Victoria Libertas,”VL” or Vuelle is a professional basketball team based in Pesaro, Italy. The club competes in the Lega Basket Serie A, Italy’s top-level professional basketball league. It is commonly known across Europe as Scavolini Pesaro, from the name of its main sponsor Scavolini, an Italian kitchenware designer and manufacturer; Scavolini co-founder Valter Scavolini was formerly club president. Let’s make 3 in a row.. with Pesaro escaping from Rome with a W.
BallinEurope, the European Basketball news site » Blog Archive » Coppa Italia preview: Can anyone stop Montepaschi Siena?